One of the things that can end up eating a budget, especially the family type, is the cost of gasoline. This will only become more self-evident as the cost of gas continues to climb higher. However, there are a number of things that you can do in order to save money on fuel costs. A tuneup on your car can reveal both minor and major issues. If an oxygen sensor is out on your car, it can end up causing your car to use much more gas than is necessary and thus drain your fuel tank much faster. Simply tuning up your car can boost your gas mileage by 1 to 2 percent and fixing a broken sensor can increase it by up to 40 percent. Things like rapid acceleration, speeding and gouging the brakes can dramatically lower the amount of miles you get to the gallon. Drive sensibly and smoothly, doing so can save you up to 33 percent on your gas mileage. It sounds simple, but cutting your driving distance and your time driven by just 5 percent can save anywhere from 3 to 10 percent on your fuel costs. The proper pressure in a tire can improve your gas mileage from anywhere between 3 and 4 percent. For every 1 psi drop below what your tires are recommended to be kept at in all four of your vehicle’s tires, you lose 0.3 percent of your gas mileage. If you’re unsure as to what amount of pressure that your tires should be filled with, refer to your vehicle’s owner manual. Do not inflate your tires to the maximum pressure located on the sidewall of your tires. Cars tend to rapidly become less fuel efficient when driven above 60 miles per hour. 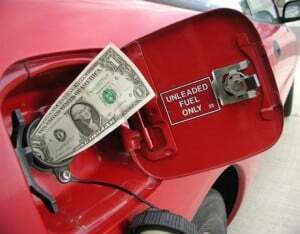 For every 5 mph you drive above 60 mph, you will end up paying an additional $0.30 per gallon of fuel. In other words, ease up on the gas pedal while you’re on the highway. Idling can and will happen. It’s nothing rare to find a situation in which you’ll be stopped at a fast food drive-thru waiting on food or you’ll be waiting with your engine on for a bank teller to come back The problem with this is that idling can cost anywhere from a fourth to a half gallon of fuel for each hour that it’s done. If you’re going to be sitting there for a long time, turn your engine off. It’s much cheaper to use a few additional seconds of fuel to start your engine again than it is to sit there with the car’s engine and air conditioning running for half an hour.